Drinking water with meals can also help you pause between bites, giving you a moment to check in with your hunger and fullness signals. This can prevent overeating, and may even help you lose weight. 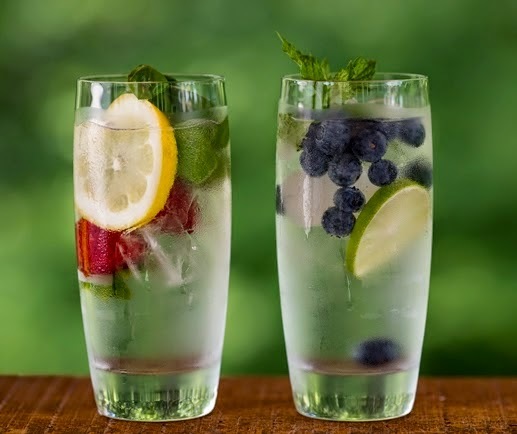 Meanwhile additionally, one 12-week study showed that participants who drank 17 oz (500 ml) of water before each meal lost 4.4 lbs (2 kg) more than those who did not. Research also shows that drinking water may speed up your metabolism by about 24 calories for every 8 oz (500 ml) you consume. Furthermore the amount of calories burned decreased when the water was warmed to body temperature. This might be due to the fact that your body uses more energy bringing the cold water up to body temperature. However, observations on the effects of water on metabolism are not universal and the effects are minor at best. Finally, it's important to note that this mostly applies to water and not drinks that contain calories. In one review study, total calorie intake was 8 to 15% higher when people drank sugary drinks, milk or juice with meals.